The Arona is a compact, crossover class, vehicle so has to inherit the best strengths from several other classes to be successful. It has to have the rugged, off-road, look of a sports-utility, for example – and it does. Note its powerful lines, imposing height and the protective plastic trim on its wheel arches, sills and bumpers. Like a supermini, this crossover vehicle must also be easy to manoeuvre in the urban jungle – and it is. It automatically steers into parking bays, has front and rear parking sensors and a rear-view camera. The compact proportions help, too. It is merely 4,138mm long, 1,780mm wide, and the turning circle is 10.6 metres. 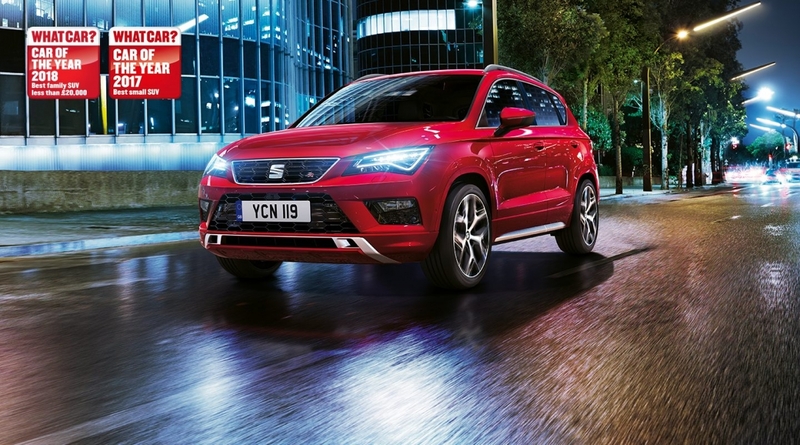 The Ateca is a sports-utility vehicle so needs different key strengths than its sibling to keep up with your adventurous lifestyle. It has to have all-wheel-drive to cope with extreme weather and light off-road terrain, for instance – and it does. Furthermore pick: snow, off-road, normal, eco, or individual mode to optimise the response of various systems to suit the conditions.